IgorWare Hasher can be used to generate a checksum for a single file or verify its integrity using verification files (.sha, .md5 and .sfv) generated by many hashing programs. The program supports UTF-8 verification files and are automatically verified if found. 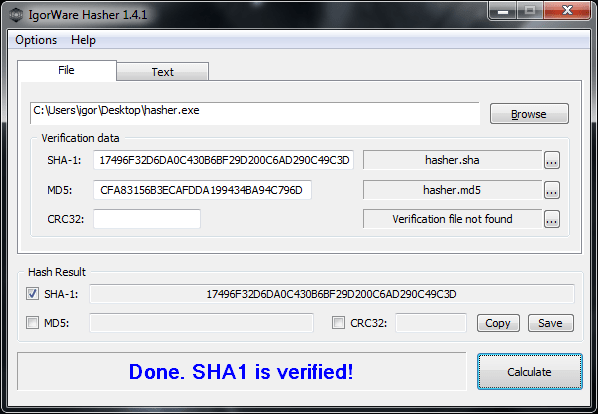 CRC32, MD5 and SHA-1 hashes are supported. How to extract: Download the RAR package and extract to a folder of your choice. Launch hasher.exe. Fix: window position was not being restored properly in situations where Windows taskbar has top or left position. I agree that HashMyFiles is the best one for multiple files I have found to date. It's small, quick and even integrates into the right click menu if you want it there. Works great to create/verify companion hashes for individual files. Wish there was a way to work in a batch mode. RapidCRC Unicode is a hashing program capable of checking and verifying the integrity of files, folders, or whole drives. The program includes process priority, ability to pause/resume analysis, job queuing, easily copy hashes to the clipboard and multi-threaded checks. If using checksum files (e.g. .sfv or .md5) for future verification, options include the ability to generate for every analyzed file, directory, or a single checksum with all hash data. Includes direct support for CRC hashing in the filename (common for anime releases) for example: "MyFile [45DEF3A0].avi") Other algorithms range from fast to secure, including SFV(CRC32), MD5, ED2K, SHA-1, SHA-256 and SHA-512. A 64-bit version is available on download page. Based on the original RapidCRC but updated with extended Unicode support. Total number of files to be calculated was always 0 in non queue mode. This is currently my go-to program. I tend to add it to the "send to" menu on machines I'm currently using and it works beautifully to check one or more files. Also, the ability to insert the hash directly into the file name makes so much sense. Just drag-and-drop it into the window and instantly know if there's a problem. Great solution to the multi-step check. I think there is something wrong with the "CRC into Filename" function. This occurs with files that lack a file extension. MultiHasher is a drag-and-drop tool for creating and checking file hashes, useful for checking data integrity. The program will check files, folders and even text using a variety of methods with both pause and cancel options for large operations. The program can then compare digests to detect changes as well as query the result to the VirusTotal database. A search tool lets you quickly track down both files or specific hashes from long lists. A recursive checking option (entire directory trees) is available in the options menu. The program can also use existing, standard hash files such as MHX, SFV, MD5Sum etc. to check integrity. Supports 64-bit operating systems and available algorithms include from fastest to most secure: CRC32, MD5, RIPEMD-160, SHA 1, 256, 384 and 512. Can include one, some, or all algorithms available in testing. I've been using this program a lot for the MD5/SHA1 and VirusTotal features for postings here on PFW. That said, I still prefer RapidCRC Unicode for hashing / checking lots of files. Make a new directory with some files in it. Drag the folder into MultiHasher and make MD5 hash calculations for all those files. Save the hash list in MultiHasher own hash format (mhx). Clear the list. Load the hash list. Drag the folder back into MultiHasher to "add" the folder. MultiHasher then hangs. Versions prior to 2.7.0.0 worked fine. MultiHasher refuses to load mhx files that are over a certain size. From what I test so far, any mhx files that are larger than roughly 150 KB refuses to load when you drag and drop the mhx files into the MultiHasher window. Instead, MultiHasher will treat it as a regular file to be hashed rather than a list of hashes. If you tried to load the file manually (Ctrl+O), MultiHasher will do nothing for these files. Files that are less than 100 KB loads perfectly both ways. Both bugs have been reported (1st bug about a year ago). However author never replied and even deleted the thread and my forum account. In other words, be aware of any potential new problems with new versions and always keep old versions. These bugs does not occur if you use file formats other than their own mhx format. Anyways, like Webfork, I now prefer RapidCRC Unicode over this. RapidCRC Unicode has been rock solid and all bugs that I have reported to the author were taken care of or were promptly responded to.